A little levitube. It's a diamagnetic levitation demonstrator. It has a little magnet in it that floats in thin air, indefinitely, with no power source except physics. It's entirely handmade by a guy who decided to make them. It's not really an invention because the effect is well documented. My goal was to create a demonstrator that functioned easily and was inexpensive to create. They can be considered homemade prototypes at this time but they are 100% percent functional, the function being to demonstrate diamagnetic levitation. Hold steadily upright or set on a surface. Adjust the lifting magnet with the bolt. At the proper height the small magnet should levitate and spin freely within the gap. If laid on its side for a long while the small magnet may appear stuck. A firm shake should free it. The lifting magnet and bolt can also be removed and used to free a magnet stuck in the gap. 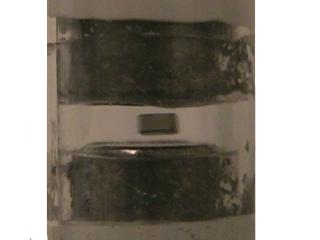 The tiny 'levitator' magnet remains suspended in air between the 2 pellets of bismuth. The 'lifting' magnet provides enough lift against the force of gravity to allow the diamagnetic properties of bismuth to be observed. Much like a metal is attracted to either pole of a magnet, a diamagnetic material such as bismuth is repelled by either pole. This repulsion is weak but when the force of gravity is balanced by the attraction between the lifting and levitating magnet it may be observed as levitation. Since the levitating magnet is free to move it is very sensitive to external influence by acceleration and other magnetic fields. Interesting effects can be observed by placing the device near small motors, power supply's and especially AC/DC transformers, which can make the magnet spin and vibrate impressively. Bismuth is a heavy, non-radioactive material. It is less environmentally hazardous than lead or mercury but should be treated with the same precautions. Do not handle bismuth without proper precaution. The magnets used in this device are fairly strong. The lifting magnet is powerful enough to damage sensitive electronics such as cell phones and computers if placed in close proximity. Use caution when handling any strong magnet as it may pinch. Do not ingest magnets. These are very simple devices and demonstration of this effect is by no means new. My main goal was to make something easy and fairly inexpensive to demonstrate diamagnetic levitation. I wanted to make educational and interesting examples of this impressive effect that just about anyone can hold and see it working. I hope that by selling these demonstrators at what I believe to be a reasonable price I will to help educate and inspire others to explore magnetism and science in general. I also hope to earn enough to explore other interesting physical effects and create educational devices such as these, and more practical devices as well. I believe that there are many reasons to study science inside and outside of formal academics. I think that resourcefulness and ingenuity are easily inspired in people. We should work together and inspire each other with our resourcefulness and ingenuity. I think this is a road to cooperation and understanding.Thank you for your interest and curiosity about natural phenomenon, please share your curiosity and fascination with others so they might be inspired to learn about new stuff. For now I'll just sell them on ebay or you can email me and I'll work something out with paypal or check/money order/snail mail with you. I'm a guy-in-his-apartment operation at the moment but I'd be happy to hear from anyone who finds this the least bit interesting. I'll set up a paypal button soon. If you buy one of these rest assured your getting a working one because if the magnet doesn't levitate, send the device back and I'll replace it. That said these are homemade and handmade so they are not built with machined precision and do not look store bought, but the magnet will levitate.